They might not wear a mask, tights, or cape to work. Or have a secret identity. Or get around town in an exotic, high-tech vehicle. And you've never seen them weld a girder by shooting laser bolts out of their eyes, or picking up that excavator one handed. But despite all of those deficits, a good construction site superintendent is worth his/her weight in men of steel. Why? 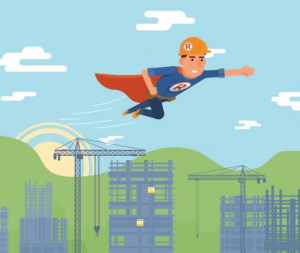 A Construction Site Superintendent Can't Leap Over A Tall Building In A Single Bound, But........He or she is quite capable of handling anything else involving a building project. A construction superintendent’s responsibilities encompass almost every aspect of a project, from pre-project legwork, to early days groundbreaking, to public relations and informational meetings, to researching and obtaining any necessary permits. A construction site superintendent is often the only "front office" supervisor that site workers and subcontractors will see on a daily basis, as well. This means that the supervisor also does a great deal of report writing and filing. A Superintendent Can't Shrink Down To Fit Into Tiny Spaces, But.....Actually, to a degree, he/she can do this. Because of their daily presence on sites, superintendents often have no office at all or a very scaled down one, such as a trailer. Fortunately, our increasingly digital dominant society makes roughing it a little easier, as with software products like Raken which allows daily reports to be written and filed using mobile devices. A Superintendent Can't Make Himself/Herself Invisible, But......Given how many people that a superintendent must see over the course of a day, that's not a bad thing. In addition to serving as the site's personnel manager, the superintendent often meets with the project manager, stakeholders, suppliers, and subcontractors. The site superintendent is also often the project employee who conducts site tours, acts as media representative, and works with regulatory offices to obtain any needed permits or exemptions. A Superintendent Doesn't Have A Justice League, But.......It's certainly important that a site superintendent has a qualified staff working under him/her, ranging from foremen to roofers, so site supervisors are generally very involved in the interviewing, hiring, and duty assignments of site personnel. A Superintendent Isn't Faster Than A Speeding Bullet, But......That superintendent still has to be plenty speedy, not to mention adaptable, to make sure that the whole project stays on track, and comes in on schedule. In addition to this, the construction project superintendent's duties include making sure that the project remains within budget. A Supervisor Isn't Recruited From The Fortress Of Solitude, But.....Site supervisors traditionally were experienced construction workers who were recruited internally after doing their time in the trenches. Now, however, with the retiring and loss of these veteran workers, it's time for firms to invest more resources and money in internships and college programs to train future superintendents to make sure that future sites aren't without their heroes.